It is the Holy Grail of science and philosophy: the one formula, one precept, one theory that will explain everything. Leonardo DaVinci attempted just such a formula. In the familiar drawing that has come to be known as “Vitruvian Man.” We’ve all seen it in its many popular incarnations: a single image of a perfectly proportioned male figure within a circle and a square. Few, however, know the story behind the picture or what it meant to the Renaissance artist/architects who saw it as nothing less than the encapsulation of universal knowledge, the microcosm of the macrocosm, a theory of Everything, the Holy Grail. In the ancient world, an inch was the measure of a man’s finger from second knuckle to third, a foot was quite literally a foot and a cubit was the distance between the fingertips to the elbow. If there were no perfectly proportioned man, then there could be standard measures and marble structures would be impossible to design and build. You can fudge a little with wood, but not with stone. Therefore, the need for Vetruvius to sculpt the standard human form by which all things could be measured was a crucial one. Copies of this statue were distributed throughout the empire and the result was massive architectural achievement everywhere the Empire touched. Vetruvian Man came down to Renaissance Italy largely because of a shift in theology and philosophy in the 12th century. Plato was out; Aristotle was in. There was a new humanism extant that postulated the human being as microcosm. Each individual man had everything in him that was necessary for an understanding of the universe and, dare we say it, an understanding of God. So there was a resurgent interest Vetruvius and his Ten Books on Architecture, as well as the perfection of Vitruvian Man. The artist was no longer just a tradesman, but was beginning to be perceived and to think of himself as a “creator-god.” Certainly, Leonardo thought so. Leonardo Da Vinci is known to be the epitome of the Renaissance Man. In Mr. Lester’s book, he emerges as a man as contradictory as he was ruthless in his pursuit of knowledge. His restless mind caused him to leave projects, be they paintings or scientific experiments or architectural designs, unfinished as he pursued other subjects. Most of his paintings, even those for which he had already been paid, were never finished. As a result, he gained a reputation for fecklessness and was often dismissed as an uneducated tradesman, which was true, in a sense. According to Mr. Lester, Leonardo had trouble with deadlines not because he was incompetent, but because he refused on principle to “simply churn out generic works as part of a factory collective. He was contemptuous of the teachings of the University, relying as they did on the works of the ancients while having little interest in learning by in personal observation. Such an education led him, at least once, into a moral dilemma. A lifelong vegetarian because of his revulsion toward inflicting suffering on any living creature, he yet engaged in the live dissection of a frog, taking copious notes and thus inflicting prolonged suffering upon it, all to determine which organs were necessary for life and which were not. Great minds such as Leonardo’s must be capable of acknowledging their hypocrisies and continuing to live. Right and wrong are not absolutes with them. One can almost smell the burning candle and hear the scratch of the pen and the slow, measured breathing of the young artist. Leonardo is presented here more human than ever. Mr. Lester paints him as a charming, gregarious young man, delighting all around him and taking great delight in them, singing, dancing, cracking jokes at his and others’ expense, and ultimately exhibiting curiosity about everything he observed. 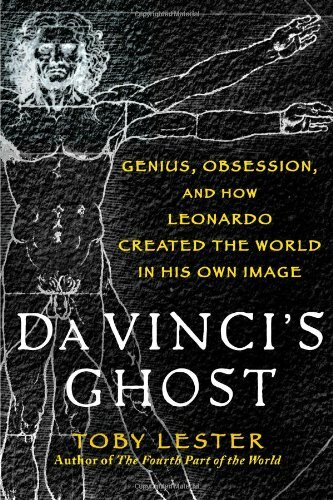 DaVinci’s Ghost is a readable and fascinating exploration of the mind of an artist who still manages, after four centuries, to surprise, inspire, and enlighten us.